Thomas Arslan has a no-frills approach to genre. A contemporary of directors Christian Petzold (A.V. Club favorite Phoenix) and Benjamin Heisenberg (The Robber), and part of the so-called “Berlin School” of filmmaking, Arslan’s films set up familiar situations and methodically deliver their plots. In the heist film In The Shadows or the gang thriller Dealer, Arslan keeps his camera still and his actors stiller. For him, everything is about the momentum of the events. 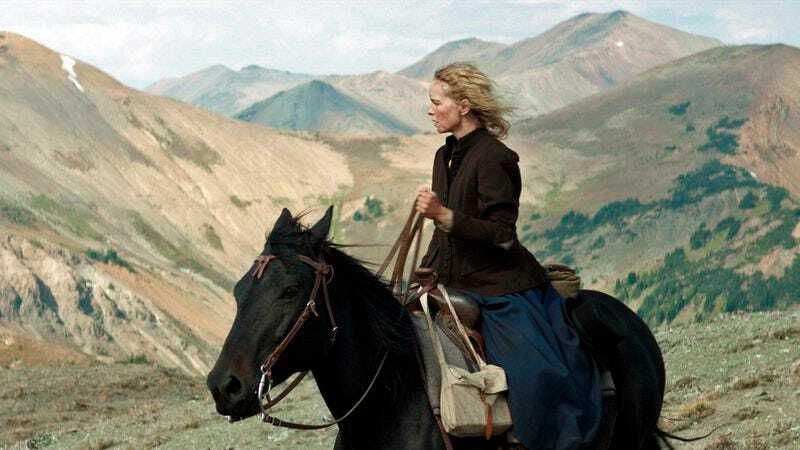 One of the more refreshing aspects of Gold, Arslan’s 2013 Canadian-set Western starring Phoenix’s Nina Hoss, is he skips on staging a critique of the Western. Arslan uses the genre’s iconography and conventions only as tools for his delivery of narrative: A group of German immigrants led by an obviously ratty guide traverse the cold wilderness in search of the Klondike Gold Rush. Hoss’ character, like the enigmatic characters she plays for Petzold, is a stoic wild card with a hidden past, but slowly takes over order in the group when danger comes. The tension, however, arises from an equally inscrutable horse packer (Marko Mandic) with a few surprising and dangerous talents. To say there is a romance between the characters would be exaggerated—they rely more on a series of insults paired with cautious glances. Arslan films the Northern Canadian landscape with less majesty and more kaleidoscope imagery, scored to a solo-guitar riff. Gold emphasizes the landscape’s harshness with occasional shots that carry a mystical quality, but the characters hold back their emotions to achieve physical goals. The plot might recall Kelly Reichardt’s feminist Western Meek’s Cutoff, but Arslan’s use of Hoss here is more of a Hawksian professional by way of Bresson. In the film’s most memorable sequence, Arslan stages an amateur amputation sequence, overloading the soundtrack with the crushing sounds of a saw and the screaming of the patient. The dark humor emerges from the blank stares of Hoss and Mandic, testing who will flinch first. Gold certainly has no interest in upending the Western, but like many of his other genre exercises, Arslan pares it down to its most central element: man vs. nature. His curveball for this traditionally masculine genre is that it could be a woman who emerges victorious this time. Availability: Gold is available on DVD from Netflix or possibly your local video store/library. It’s also currently streaming on Netflix.